On June 17, 1982, the body of Italian banker Roberto Calvi was found hanging from the Blackfriars Bridge in London. Initially his death was ruled a suicide; later he got upgraded to murder. A Mafia informant identified a killer but, sadly, Mafia informants tend not to be terribly trustworthy. Sadder still, there was no shortage of potential suspects as Roberto Calvi was a wanted man in more ways than one. The details of his murder remain undetermined today. 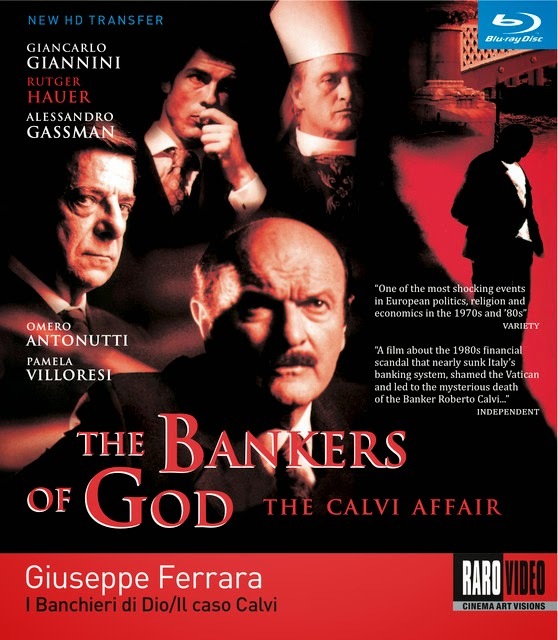 Giuseppe Ferrara's “The Bankers of God: The Calvi Affair” (2002) doesn't provide any definitive answers about the infamous scandal, but it sure proposes a lot of intriguing possibilities. Ferrara wanted to make the film since the mid-'80s but a series of production deals never quite materialized, and the 1994 death of the great actor Gian Maria Volonte, long attached to the project, did little to expedite matters. Perhaps the prolonged gestation explains why a film eventually shot in 2001 still looks for all the world like a relic from the '80s; or maybe Ferrara and his team just did a remarkable job of period recreation. From the costumes to the hairstyles to the graphics to the low-fi quality of the image (perhaps partially attributable to a so-so high-def transfer here) this feels like a film shot just after the events it depicts. When we pick up the story, a power shake-up at the Banco Ambrosiano, one of Italy's largest private banks, places the unimposing but ambitious Calvi (Omero Antonutti) in charge. It doesn't take long before he is embroiled in scandal too as he is sentenced to four years in jail for illegal money transfers. An acquaintance jokes that it was “his turn to be arrested” but it's no joke to Calvi; he's a power-seeker but not a tough guy and jail scares the hell out of him. Somehow he not only survives (despite a suicide attempt) but returns to his job at the bank. His troubles are only getting started. Antonutti does a marvelous job of depicting the doughy, sweaty Calvi as alternately vulnerable and scheming. It's never entirely clear what he's really guilty of, but what is readily apparent is that whatever delusions of grandeur he may have had while climbing the corporate ladder are dispelled by the discovery that he is but a tiny fish among the sharks. He has cut deals (some legal, some less so) with the local Masonic lodge (apparently a real power broker in Rome), the Vatican Bank (an even bigger broker and a major investor in his bank), and possibly the Mafia (not that they exist) and this little man is fated to be somebody's fall guy. Ferrara's film rockets from one event to the next with sharp, abrupt edits dropping us in the middle of the action in the next scene with little effort to orient the viewer. The brisk pace might make it difficult for non-Italian speakers to keep up, but the puzzle pieces aren't all meant to snap together. To describe the web of connections as complicated is a gross understatement. Everyone has a hand in the till, most certainly including the Vatican. Perhaps the film's most controversial claim is that Pope John Paul II was constantly kept informed of the Calvi affair as it unfolded. The pope is only photographed from behind “out of respect for his Holiness” but in one of the most amusing scenes in a film that can be surprisingly wry, the pope (still shot from behind) is shown riding his exercise bicycle rather half-heartedly while a cardinal (played by Rutger Hauer) updates him. Ferrara's “respect for his Holiness” has its limits. Viewers seeking clarity will be frustrated as the story (scripted by Ferrara and Armenia Balducci) gets lost in it endless layers of conspiracy. But that's largely the point. If there's anything more muddled than religious doctrine, it's modern finance, not to mention Italian politics. Calvi was known as “God's Banker” and he got muscled out by his partner. The poor guy never stood a chance. I feel a little guilty for getting a few chuckles watching his inevitable downfall play out, but then I've come to terms with the truism from “Life of Brian” that the last laugh is on you. The film is presented in a 1.66:1 aspect ratio. I experienced intermittent problems with the video looking choppy in the early scenes though that cleared up in short order. However other scenes showed evidence of noise and distortion; nothing major but it's certainly not smooth and flawless. 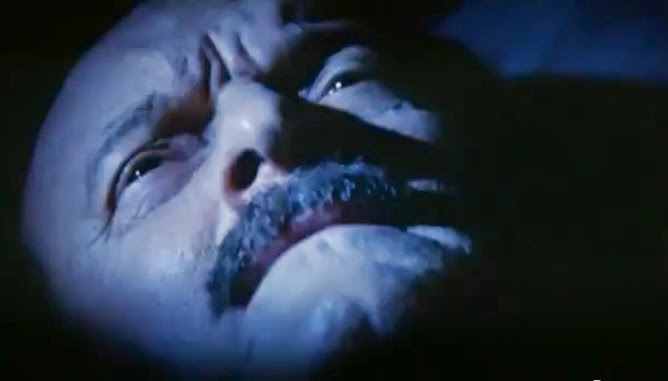 Image detail in this high-def transfer from Raro Video is merely adequate and the film has a slightly greenish tinge at times and the colors are generally somewhat muted. It's not bad, just nothing special. The LPCM 2.0 audio mix is fairly clear but more than any disc I've played in a long time, the different elements are mixed at different volumes. Some voices (especially Calvi's wife) sound unusually loud and I had to dial down the volume substantially from its usual settings. Music, by contrast, is much quieter. Still, no distortion or obvious dropoffs can be heard. 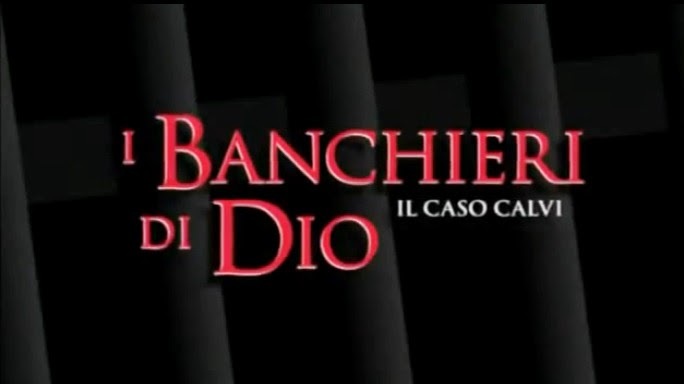 Optional English subtitles support the Italian audio. The white subtitles are tough to read against some of the white backgrounds, but it's not too bad. The film can also be played with an English dub which I haven't checked out. The only extra on the disc is an interview (21 min.) with journalist Gianni Barbacetto who does his best to fill in some of the blanks regarding the real-life Calvi affair, but it's a hopelessly convoluted story. Which is what makes it so interesting. The slim 12-page booklet also includes a lengthy essay on the subject. I'm fascinated by stories of financial corruption so this film was right up my alley. It feels a bit like a dramatic reenactment of a really complex episode of “American Greed” and that's fine with me. Church vs. Bankers. Whoever wins, we lose.